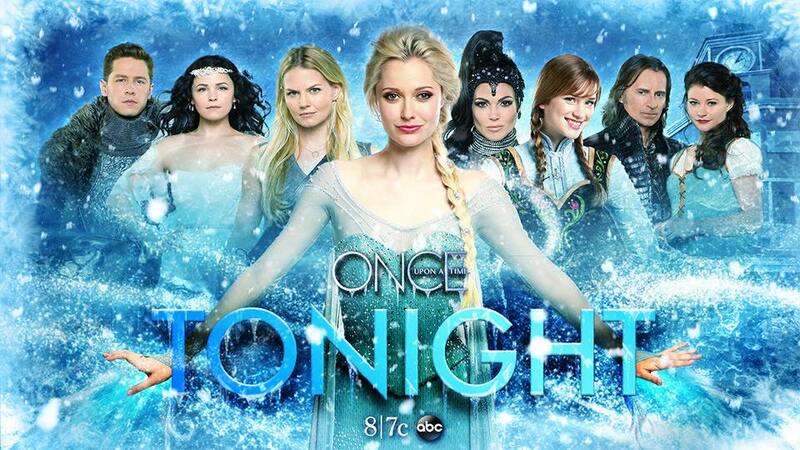 This Mother’s Day, Once Upon A Time will air its series changing season finale! Before we find out if Henry can save everyone from the Author’s pen, here are several highlights from this season of OUAT! Technically, Season Four began at the very end of “There’s No Place Like Home,” when Arendale’s queen broke out of her urn. Elsa (Georgina Haig)’s unexpected arrival set the tone for the first half of the season. Loyal Evil Regals feared that their queen would go back to the dark side at the beginning of the season when Emma (Jennifer Morrison) and Hook (Colin O’Donoghue) brought back “Marian” to present day Storybrooke. However, Regina (Lana Parrilla) did the right thing and saved Robin Hood’s past love from death when she used a fireball on Elsa’s icy creation! This moment showcased that the Evil Queen was still on the road to redemption! One of my favorite non-romantic pairings of the season was Rumple (Robert Carlyle) and Ingrid the Snow Queen (Elizabeth Mitchell)! Their chemistry when the two characters shared scenes was electric. One of my favorite exchanges of the first half of the season occurred when Rumple showcased his trump card, the Sorcerer’s Hat, and threatened to trap Ingrid in it. Frozen fans finally got their wish when the Sisters of Arendale reunited after being apart from each other for a couple of episodes. Both Haig and Elizabeth Lail (Anna) brilliantly delivered that reunion scene and made fans scream with delight. Ingrid’s “Spell of Shattered Sight” inverted all of Storybrooke and made them the darkest versions of themselves. The person affected the most by it was Regina! The Evil Queen briefly made a nasty reappearance as she threatened little Neal’s life while under the Snow Queen’s spell. This led to one of the best catfights of the season between Regina and her longtime rival-Mary Margaret (Ginnifer Goodwin). Just before Ingrid let Storybrooke burn itself to the ground, Anna saved the day by delivering a letter from her mother (and Ingrid’s dearly departed sister) that said that she should have embraced her sister (and her daughter)’s powers instead of viewing them as monsters. After touching the Arendale seal, Ingrid got her happy memories back and realized her wrongdoing. She sacrificed herself and retracted her spell. Ingrid’s death remains one of the show’s most haunting (and tragic) deaths. Hearts of Rumpbelle fans were breaking when Beauty banished her Beast from Storybrooke! After learning that her husband embraced his quest for power over their love, Belle (Emile de Ravin) furiously forced the Dark One to step over the town line…leaving him powerless. While Gold was furious with his predicament, the Dark One decided that he needed reinforcement to continue his quest. 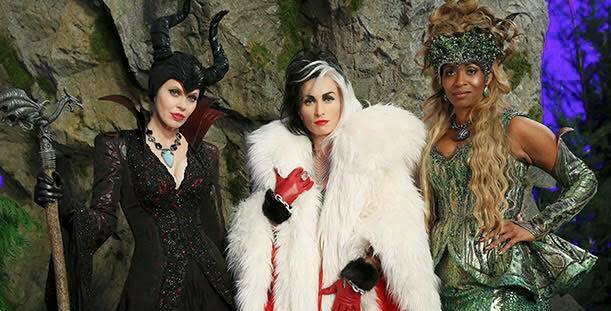 Gold’s reinforcements came in the form of three very nasty and iconic villainesses: Maleficent (Kristin Bauer van Straten), Ursula (Merrin Dungey) & Cruella de Vil (Victoria Smurfit). While the trio made a formidable force, they nearly killed each other during their first encounter! As Gold and Ursula prepared to fetch Cruella, the Dark One unleashed his revenge on the town. He sent his ex a spell that not only released the fairies from their imprisonment in the Sorcerer’s Hat, but also unleashed one of Disney’s most feared and omnipotent villains: Fantasia’s Chernabog! When a resurrected Maleficent vowed to destroy the Charmings’ lives for banishing her daughter to the real world, the royal couple desperately turned to their longtime enemy to act as their mole. Regina had to test her loyalties to her former colleagues in the ultimate game of Chicken–rescue them from a speeding train! This scene perfectly blended intensity and comedy together, plus one hysterical unseen result: Evil Queens’ Girls Night! OUAT fans were excited to learn that Eion Bailey would reprise his role as August W. Booth earlier this year. Emma’s former Guardian Angel returned when Gold undid the Blue Fairy’s magic and forced the now-aged Pinocchio to answer questions about the Author’s true location. You have to give it to Once creators Adam Horowitz and Eddie Kitsis…. bringing back the Wicked Witch (Rebecca Mader) into the picture was so unforeseen that it shocked fans and broke the Internet! From holding Rumple’s heart potion over his hospital bed to breaking Regina and Robin’s (and Outlaw Queen fans) hearts that she is expecting Robin’s child, Zelena proved that revenge is best served cold! I hope that Ms. Mader gets a Emmy nomination for her work in “Heart of Gold,” because it was one of the show’s best monologues in its’ four year history. 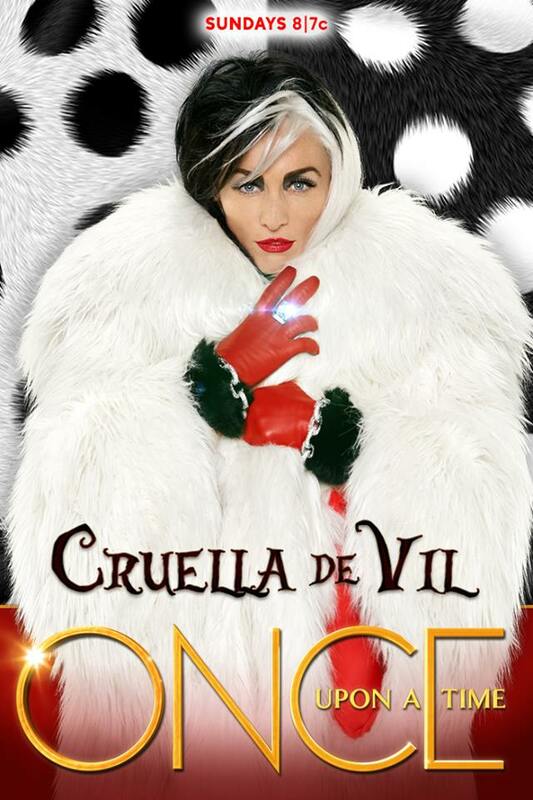 If you ever told a die-hard Disney fan that Cruella de Vil would defeat the Mistress of All Evil, they would laugh in your face! However, they would take back their words once they see this clip from “Sympathy for the De Vil.” When Maleficent confronted her fellow Queen of Darkness about her daughter, the 101 Dalmatians villainess confessed that she left Lily in the woods to die. Before an enraged Maleficent dragon could eat her for lunch, Ms. de Vil unleashed her animal controlling smoke on her friend and chided the dragon for underestimating her! Emma and Lily had an intense reunion that almost led to Maleficent’s daughter’s death. While Lily prodded her former friend to kill her, it was up to the former Evil Queen to rescue her frenemy from a lifetime quest of redemption. This marked another important chapter in Swan Queen history and I hope that we get more moments like these in the future! I do not own all the clips that are featured in this article! They belong to the American Broadcasting Company.